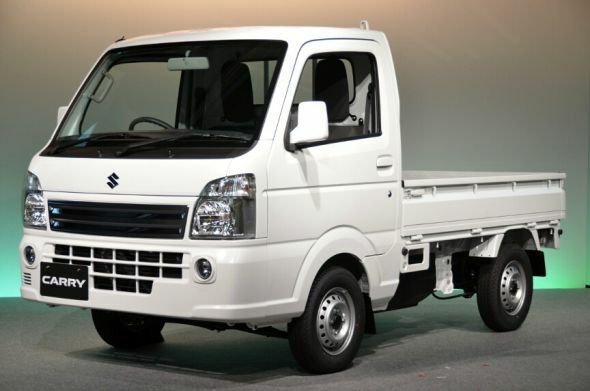 India’s largest car maker will foray into the commercial vehicle (CV) space next year, when it launches the Indianized version of the Suzuki Carry mini pick up truck. Codenamed the Y9T, the Carry will be outfitted with an 800 cc turbo diesel engine that Suzuki Japan is developing for use in the mini pick up truck. A twin cylinder turbo diesel motor, the 800 cc engine could eventually land into Maruti Suzuki small cars if refined enough for use in the passenger car segments. Maruti Suzuki is also said to be readying up petrol and CNG powered versions of the Carry/Y9T pick up truck. The 1.2 liter-4 cylinder petrol engine from the Eeco mini van is likely to be the engine option that will power the CNG and petrol engined versions of the pick up truck. The diesel engined Y9T could start at 4 lakh rupees, and will be aimed at market leader Tata Ace. It remains to be seen whether Maruti Suzuki sets up an independent dealership and after sales network for its commercial vehicle foray or whether the automaker will sell commercial vehicles through its existing nationwide network of dealerships and service centers. The latter seems more likely with a showroom-in-showroom format as the the Suzuki Carry based Y9T pick up truck will be the sole CV offering from Maruti for at least a couple of years after launch. The mini pick up truck segment in India logs volumes of about 200,000 units each year with first mover Tata Ace dominating the hustings. As the country gets more industrialized, the demand for mini pick up trucks will only increase in the coming years. Mini pick up trucks are compact and fuel efficient, a vital cog in last mile logistics, especially in developing countries where roads aren’t wide enough to accommodate larger trucks.